The Met Office had half of the west coast in flood warning, locally the clouds were overcast pretty much everywhere, the METAR said cloud base at 1,800ft with rain coming. Well it’s got to be another cancellation then hasn’t it? Upon arrival, to my surprise the lesson was still on. Another quick run through the briefing of a Practice Forced Landing (PFL), then out to check the plane. 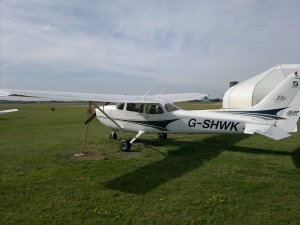 G-SHWK, still with one strobe not working, had a rain covered windscreen and I must have walked round that plane with a constant muttering of “This is getting cancelled…..” It was already spitting by the time I was checking the propeller. Normally this results in an instructor marching out to say it’s all off. I like turning switches on and off, so figured might as well do the internal checks – but this lesson is going to get cancelled, for sure. Internal checks done, just waiting for an instructor……..and waiting……now doubt starts to creep in. This doubt thing is new, recently I’ve found myself expecting some sort of meteorological challenge, no idea why but I think it’s a sub-conscious sign that I’m past the “new and nieve student” phase and am now anticipating that more is expected of me. Perhaps I should be speaking up more about the weather? Perhaps that’s why I’m still sat in a plane and there’s no instructor in sight. Maybe they’re waiting to see how long it takes me to reach this conclusion on my own? We can’t seriously be going in this, the windscreen is now raindrop covered again. Must be waiting for me to come back. The next hi-viz jacket out of the club door isn’t my instructor, so I decided to lock the plane up and go and see if there’s been a revelation back in the club with respect to the rain and clouds. There’s still no way we’re going to get up in this. On return to the club my instructor was confused to see me, assuming there must be a problem with the plane. Hmmm apparently we’re still going, really? Ok then. This is my favorite of the clubs airplanes, I don’t want anyone attempting to steal it! With a slight bit of mental autopilot (ATC said taxi to Delta, I replied taxi to Alpha…. ), it was off to the far side of the airport. On a sunny day a trip to Delta is quite nice, it’s down a grass hill taxiway. On a freezing cold, threatening to rain hard any second, November morning. Alpha would have been nicer, but we had a chat amongst ourselves it’s all good. Our long taxi, ball park a mile, down to delta had allowed the Beechcraft to start its engines and as they were cleared to Alpha, beat us to the runway – now we’d have to wait for them to take off. No harm though, if you want to watch planes take off, holding point Delta is about as good as any spot you’ll find. With that done and the windscreen scatter gunned with droplets of rain, we rolled out on to the runway, opened the throttle and it was up, up and away. Up…..up……straight into a haze of mist and stuff that had aspirations of becoming cloud. At 1,500ft – Horizon, what horizon? Another few hundred feet to the cloud base and this would have been on, but as things stood it had been a lot of fun getting to this point (I was still amazed I was actually in the air at all). Time to call it quits and head for home, still we could try a high glide for the landing and get a bit of practice in. We were overhead before realising/remembering, that it was a right hand circuit and I’d managed to fly it more in-keeping with where we should be for a left hand circuit. Now we were too far downwind, to save time my instructor took over for some steep turn adjustments to our position. It’s been ages since I’ve flown a right hand circuit and forget looking out of the back window to see where the runway was relative to us – it was just fogged up with rain/mist and condensation. Removing the power for the glide approach, the net result was I was guessing the base turn. Guessed wrong and was promptly FAR to high. 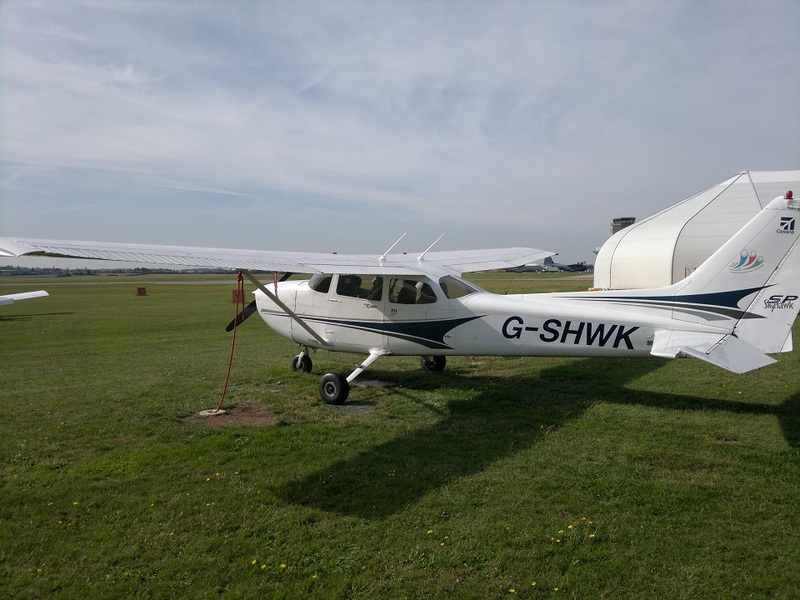 A chance for a demo of how much you can get a Cessna to drop in side slip if you want to, but even with all of that and full flaps……..we’d have landed halfway down the runway. Time to Abort and try that again. Again cleared for a high glide, this circuit was at 1,500ft. Now being a full and proper circuit it was a bit better, but as soon as the runway disappeared to the back windows, it was gone – I’ve done this enough times to generally know what the world in front of me should look like turning on to base, but I’ve not done a high glide this way round before so there were still some variables. It was again to early and to high, but workable. There’s two large pools of water at the near end of the runway (land short if you dare) which give huge amounts of sink, so you don’t want to come over these low with no power. The landing was a bit flat, but a gentle enough touchdown to be happy with. My second (what I’d call) decent landing with the same instructor in a row, it’s starting to feel much more natural and to be expected. Looking back, other than in hideous crosswind, it was September the last time I landed hard. Maybe I’m learning something…. 40 minutes of flying – but no tick in a box. Sure we didn’t tick the PFL box today, but I’ve never gone flying in weather like this before. In months gone by this would have been a early morning phone call telling me not to bother, so from an experience perspective I count it as having actually been really useful. It was a chance to take off in light rain, get a bit more radio practice in, do another glide approach and get another landing on the books. All in all, a lot of fun, valuable practice and a great experience. This entry was posted on Monday, December 3rd, 2012 at 7:30 am by PHC	and is filed under Actual Lessons, PPL Course. You can follow any responses to this entry through the RSS 2.0 feed. You can leave a response, or trackback from your own site.